Santa María Atzompa is located twenty minutes from the state capital of Oaxaca Mexico, in the region known as Valles Centrales. 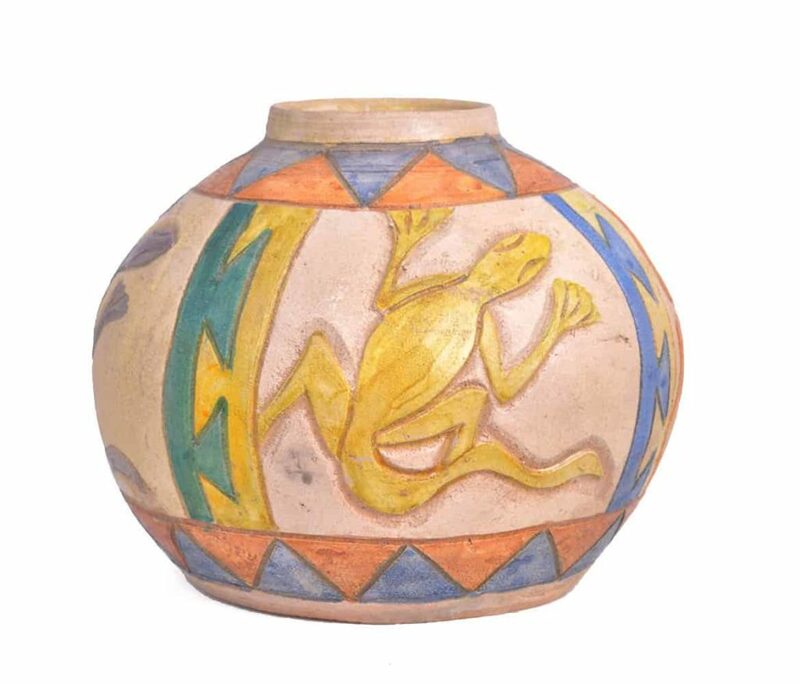 This region is acknowledged for its millenary pottery tradition, and for being an important centre of production of utilitarian handcrafts since pre-Hispanic times. 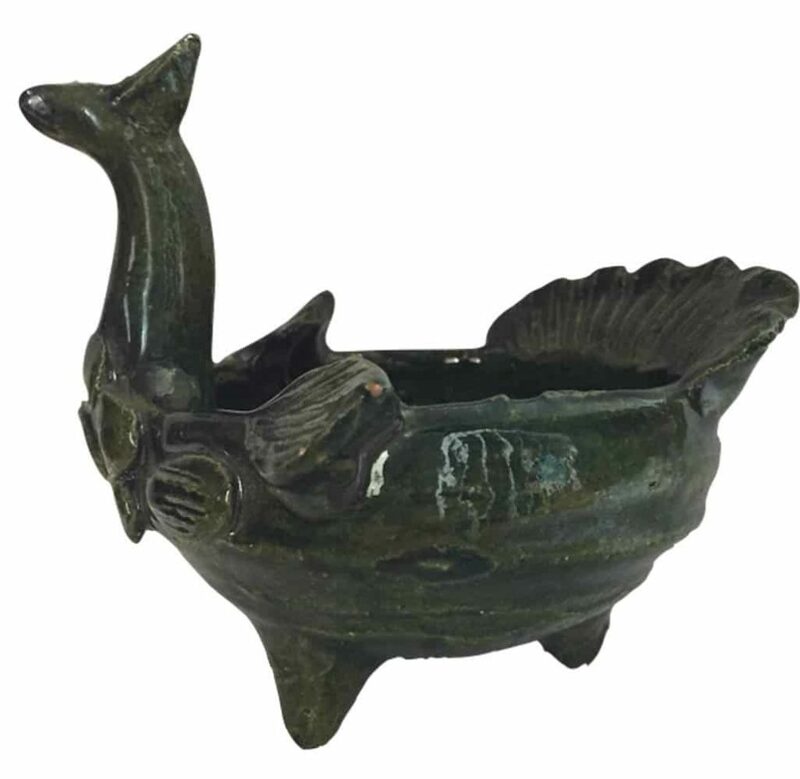 This community reaffirmed its popularity during the colonial period due to the characteristics of the raw material of the region and the skill of the potters. Under this period they developed the technique that identifies Atzompa as a clay production area until today: the finish glazed in “bottled green”colour, which takes different forms in the hands of the craftsmen, examples of these are sauce containers, jars to pour chocolate as a traditional beverage and small figures of sheep covered with chia seeds that, when exposed to water, are filled with small plants by the process of germination. This is a characteristic tradition in the celebration of the Catholic Easter. In this small town, whose landscape allows us to perceive the working conditions of most potters, is where Dolores Porras atelier is based. Currently, it is here where her son Rolando Regino Porras lives with his wife and two children. Dolores was born in 1937. From the age of thirteen, she dedicated her vital force to pottery. 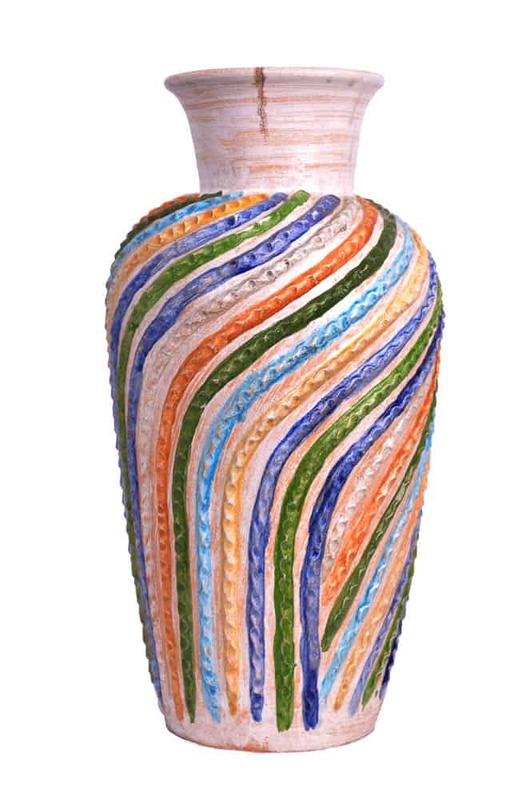 In the 80s, she began to experiment with new techniques to obtain a greater variety of tones that, based on the oxidation process of metals obtained a glazed finish, beyond the green colour used traditionally in Atzompa. Dolores also took advantage of pastillaje techniques and bas-relief mixing new forms and figures over traditional models, creating a style of her own that defined her production. 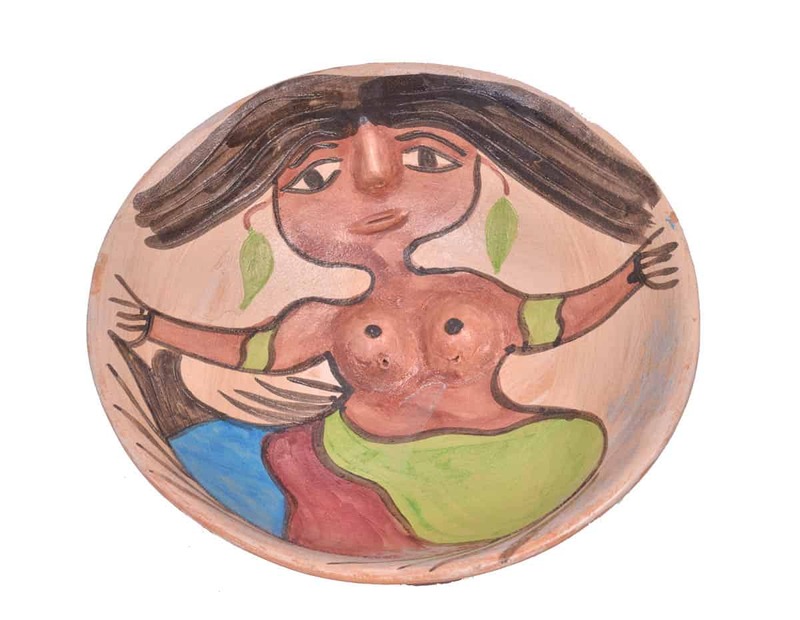 As a result of these innovations, product of Dolores Porras inspiration we can mention an iconic work Las Vendedoras, as the same potter named them. These are female figures approximately eight feet high, which in their structure represent women accompanied by-products, whose attitude reflects the action of selling also handicrafts as clay pots. Another iconic creation of Dolores is the rimless bowls with mermaids. These plates of 20 inches of diameter show an abstraction of a mix of a fish and a woman, with details in high and low relief. The nose and breasts are remarkable well-achieved in high relief, along with the colour in the lower part of the anthropomorphic figure, where different shades of green, yellow and blue stand out. Many of the Dolores Workshop creations are inspired from the trips she made along her life through México. The inclusion of fishes, iguanas, and other forms of flora and fauna that have been reflected in her work, are irrefutable evidence of these experiences. 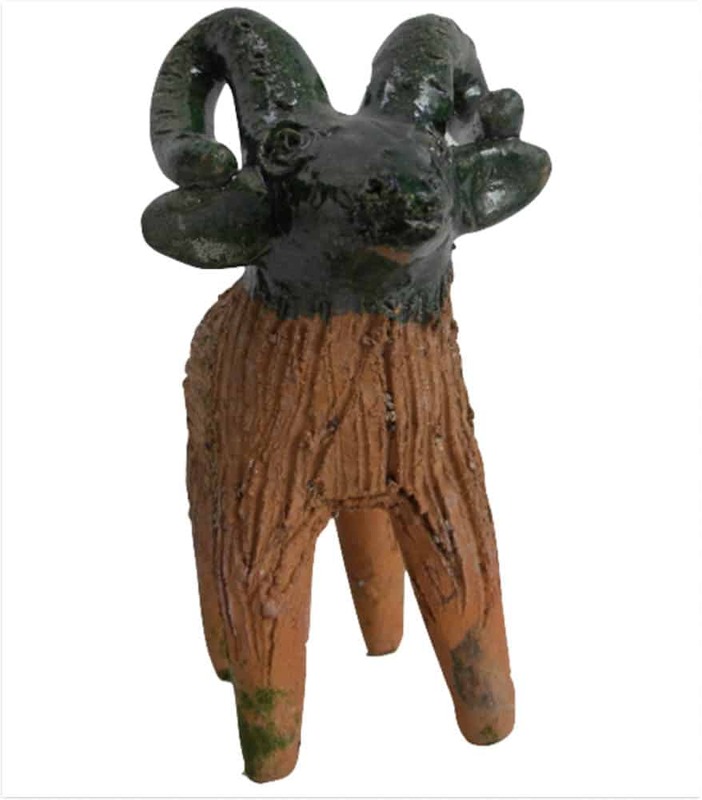 Although innovation is a determining factor in Dolores’ work, so is the transmission of the ancestral knowledge that she has printed in the work with clay. Dolores Porras raised in some members of her family, in particular in her son Rolando Regino Porras, not only an economic way of production based on creativity, but also the need to experiment and find other ways that would give a concrete sense of form and function to the ancestral work of the town fathers. 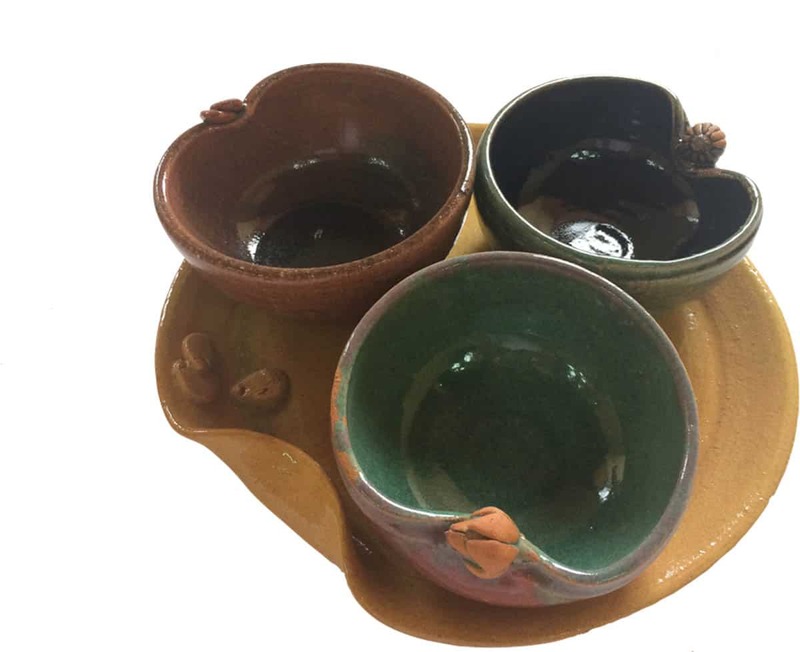 Since 2010, the year in which this pioneer of glazed clay techniques passed away, and to date, the Dolores Porras Atelier has continued with the production of glazed clay. This artist developed techniques that, at her time, were innovative and turned around the production that was based on the work of her family. Currently, experimentation continues to seek cures and synergies between design as a discipline and ancestral knowledge for mixing, by modelling and baking pieces that use specific production lines, from which Variaciones, an exhibition that was held between 2015 and 2017 and whose most important venues were Mexico City and Oaxaca. The 65 pieces that are shown in this exhibition represent a universe of constant change. By renouncing to use lead materials in the pottery production of Santa María Atzompa in Oaxaca, which generated health problems, Rolando Regino Porras embarked on a different route towards the exploration of other forms and materials. From the earth itself, which is the essence on which the clay is based, generates a wide kaleidoscope of incomes and outcomes for the utilitarian ceramics. With the advice of the Fuego con Juego workshop from Mexico City, the Dolores Porras Atelier presents a product of the techniques and material transformation, particularly lead-free enamel with greater colour, accompanied by organic forms that forge a background in the experimentation itself, thus combining the acquired knowledge with elements of contemporary design. From the curatorial artwork of Acacia 360º, Variations is a sample of the way in which time can play in favour of those productions based on classical materials such as clay, and of characters such as Rolando Regino Porras, while involving various cultural sectors in the search for new horizons for the production of knowledge, hand to hand with the forms of collaborative work between creative and introspective environments. 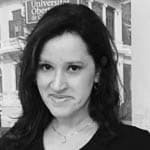 Johanna Ángel Reyes is an anthropologist and PhD in culture and communications. She is founder and head of Acacia 360º, a platform for arts and culture projects in México and Latin America. Actually, their research topics involve popular art process incorporation in creative economies. In the year 2015, our research team published “Dolores Porras. Legado sin reservas” which is a catalogue with some texts about Dolores Porras workshop and some illustrations taken from pieces that are part of a familiar collection. Today, it is possible to visit the atelier and her creations, accompanied by Rolando Regino Porras and Lorena Lávida work in progress, in Santa María Atzompa-Oaxaca.